RIT’s new interdisciplinary initiative is helping to support Dubai’s vision in becoming a smart and sustainable city before hosting World Expo 2020. Dubai is on a quest to become the world’s “smartest city” before hosting World Expo 2020. And RIT Dubai is helping make it happen. Smart cities are a way for municipalities to improve quality of life for residents in areas such as water and electricity, public health, sanitation, transportation, affordable housing, infrastructure, IT connectivity and digitalization, and safety and security. Tapping RIT’s core strengths in sustainability, architecture, computing, imaging science, design and engineering, RIT’s global campus in the United Arab Emirates was invited to partner with the Dubai Silicon Oasis Authority and Smart Dubai to support this goal. Last year, RIT Dubai launched the first smart city professional diploma and a Master of Science in city science—the first of its kind postgraduate degree specifically for Dubai. The courses were developed by an interdisciplinary team of faculty from RIT’s Golisano Institute for Sustainability, the B. Thomas Golisano College of Computing and Information Sciences, and the College of Liberal Arts. James Myers, RIT associate provost of international education and global programs, said RIT has received requests to develop similar initiatives from municipal governments in China, India and Peru. “We have used the unique capabilities of the School of Individualized Studies to integrate content from across campus to address the emerging needs of urban environments. 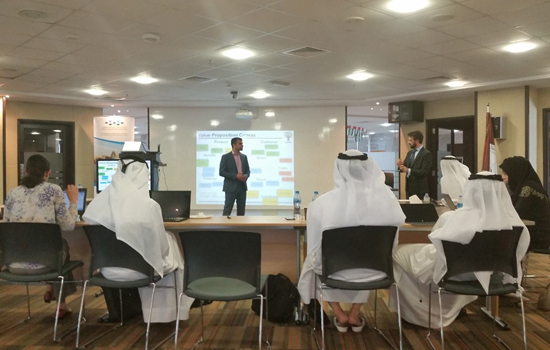 According to RIT Dubai President Yousef Al-Assaf, the smart city professional diploma program was initially aimed at government employees and leaders to give them practical knowledge on smart city developments and make them key innovators. “The introduction of the Master in City Science closes the circle of developing experts in the field that could benefit the development of the smartness concept in Dubai,” said Al-Assaf. Completed student projects for the smart city professional diploma included the top winner: “Dubai Funds,” an online/smartphone platform for crowd-funding government collaborations. The second and third projects addressed Dubai’s goal of attracting 20 million visitors by 2020: “Smart Tourism,” an online app where tourists connect with one another and all the city has to offer, and “Happy Taxi,” the promise of free and fun taxi rides for all in Dubai. Citing United Nations predictions that the number of people living in cities will double to nearly 70 percent by 2050, Nabil Nasr, an adviser to RIT Dubai’s new degree program, said reducing the city’s environmental footprint is one of the challenges of cities. “People tend to think of smart cities as futuristic, and there is even talk about ‘smart planets,’ but with more than half the world’s population living in cities today, the need to optimize and enhance the quality of life for urban residents and communities becomes even greater,” said Nasr, RIT associate provost and director of the Golisano Institute for Sustainability (GIS). Mark Krystofik, program manager in GIS, said the wave of the future is when smart cities can talk—giving us live status updates through our wireless networks on traffic patterns, pollution, parking spaces, water and energy resources. 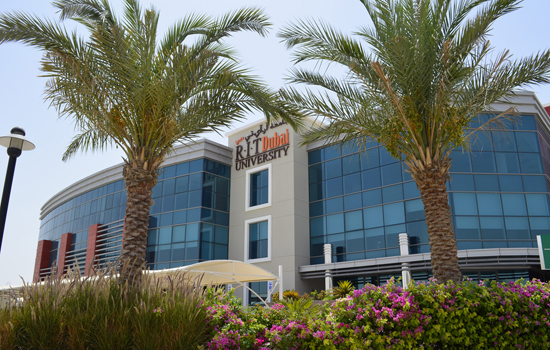 A classroom at RIT Dubai, the university’s campus in the United Arab Emirates, which now offers diploma programs and degrees in smart city science.